You’ve worked hard for your money… now it is time to enjoy the fruits of your labour, by remaining healthy! Baby boomers are well aware of the benefits to exercising on a regular basis: to improve overall health conditions, lower blood pressure, reduce cholesterol and maintain their youthful glow. But many continue to work out grudgingly and miss the passion that drove them in the sports of their youth. “Exercise is often perceived as a necessary evil. At the gym, there isn’t a lot of excitement or laughter – people are putting in their time almost as prisoners on their solitary workout stations. They’re working away, and relieved when it’s over,” observed James Gavin*, an Applied Human Sciences Professor with Concordia University. While team sports and martial arts would appear to be reasonable solutions, boomers are starting to consider themselves too old for such undertakings. 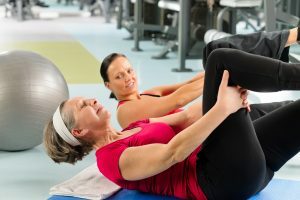 Therefore it is paramount for new marketing techniques for physical activity be developed to relay the multiple benefits in health and lifestyle throughout the retirement years. Time to take care of your health? What about your FINANCIAL HEALTH? 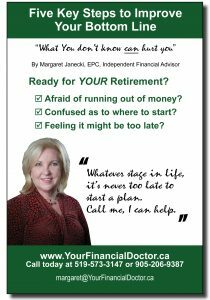 Call me today… it’s never too late to start a plan!